Enterprise Mobility Suite to become Enterprise Mobility + Security: This name change doesn’t impact existing EMS customers. A new, expanded plan will be generally available later in 2016 and will be known as Enterprise Mobility + Security E5 and the existing Enterprise Mobility Suite becomes Enterprise Mobility + Security E3. The existing Azure AD Premium becomes Azure AD Premium P1, with no change for existing customers. 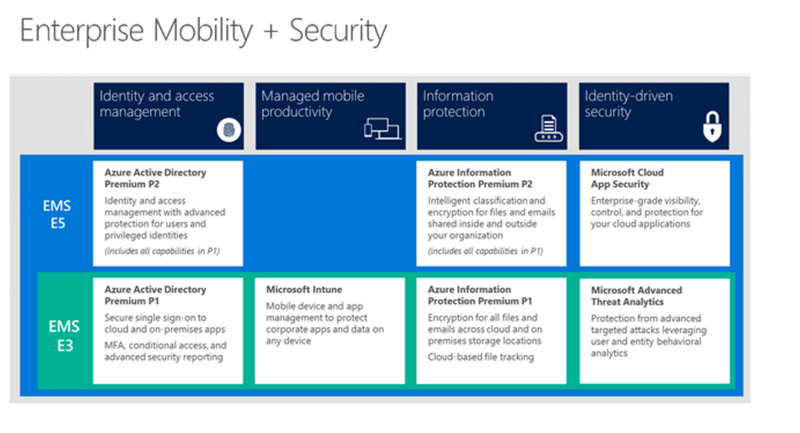 Azure AD Premium P2, generally available later in Q3 2016, includes all the capabilities in Azure AD Premium P1 as well as the new Identity Protection and Privileged Identity Management capabilities. The existing Azure Rights Management Premium becomes Azure Information Protection Premium P1, generally available in Q4 2016, with no change for existing Azure RMS customers. The P2 offer adds automatic classification, on top of the manual classification, labeling and everything else included in P1. Microsoft Advanced Threat Analytics (ATA) become Microsoft Cloud App Security.